Each of the various items on this page can be built to match our other pieces in a particular style. Contact us for information on pieces in styles not shown in these photos. Our portable bar offers a quick party set-up. Set on casters, it can be moved into the room for ease of use and then back against the wall for storage. Shown in the Wilderness log character from our Yellowstone Collection, it is also available in the Standard and Burl log styles. Inside there are drawers and adjustable shelves to take care of your storage needs. The stemware and wine racks are options that can be ordered to customize the design. 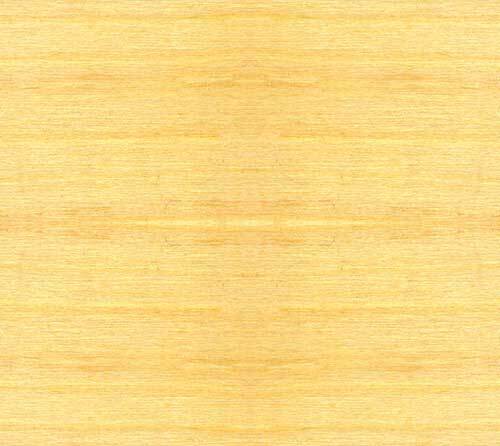 Another option is the bar built in Knotty Alder from our American Prairie Collection. It also offers a variety of custom storage options. Pub Tables (left) are rustic accents that provide a handy surface for drinks and snacks and can be built to match the style of your billiard table. Tables are 42-inches high with 30-inch diameter tops. Available in Wilderness, Standard, and Burl. 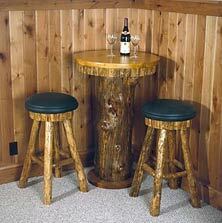 Bar Stools (below) have half-log seats to create a distinctive look. Swivel Bar Stools (shown at left with table) are available with or without upholstery and in all embellishments. Upholstery options are vinyl (with no up charge), or leather, hair-on-hide and ultra-suede upholstery (for an additional charge). Straight-Back Barstools (above right) are available with either a ladder-back or upholstered back, similar to our spectator chairs. 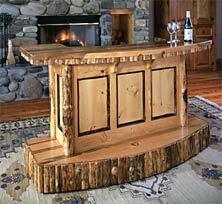 They can be built with the same log treatments and upholstery options as our other items. Shown is the Wilderness Style.